With Valentine’s Day swiftly approaching, many local theatres are featuring the fun romantic comedy or deep romantic drama to attract lovers young and old. 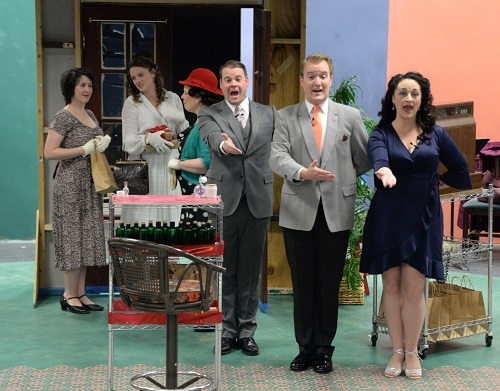 Newtowne Players, in Lexington Park, chose to deliver a crowd favorite with their production “She Loves Me”. Written by Joe Masteroff, this classic features music by Jerry Brock and lyrics by Sheldon Harnick, and captures a timeless tale of young dreamers, misconstrued feelings, and the power of love to overcome. If you are looking for a great way to celebrate the love of your life or just enjoy a story about falling in love, go see this show. You won’t be disappointed by the quality and the heart that Newtowne Players brings to the stage. Set in Hungary in the 1930s, this story develops quickly, introducing the audience to the many characters who work in Maraczek’s Parfumerie and the customers they encounter. Attention comes to rest on Georg Nowack, a young sales clerk in the perfumery, whose love life currently consists of letters written by a ‘Dear Friend’ through the Lonely Hearts Club. Fun is had as the audience obtains a feel of his daily work environment, captures perfectly by the lyrics and music of “Sounds While Selling”. Suddenly, his world turns upside down when Amalia Balash walks into Maraczeck’s and manages to sell a singing cigar box, causing Nowack to lose a bet with his boss. She also, coincidentally, happens to be receiving and sending letters through a Lonely Hearts Club to a ‘Dear Friend.’ Through comedic lyrics and carefully crafted lines, the audience follows the two along as they both chase after their ‘Dear Friend,’ and discover that more than hate burns between them. Along the way, we delve deeper into the love life (or lack of) for each of the supporting characters as the plot thickens. I am a massive Broadway fan but was shocked to find that I have never heard of or seen this gem of a show. From the opening number to the final bow, this show is fantastic! The lyrics are clever, filled with wit and tears, and accurately capture the rollercoaster of falling in and out of love. Kudos to Brock and Harnick for their genius, which perfectly melded with the book that Masteroff wrote. I can see why Director P. Wade Thompson has been waiting on pins and needles to direct or perform in this play. This talented cast is fun to watch! To pick out a few favorites, Carlton Silvestro was marvelous as Georg Nowack, Jeff Maher was hilarious as Ladislav Sipos, and Sarah Gravelle was perfect as Amalia Balash. The best cameo in the show went to the Busboy, played by Luke Rowe, who left the audience in stitches. However, the entire cast was not only cast well, but each character was poised, developed, and added depth and meaning to the story. On the technical side of this show, I found it to be flawless. This musical featured a live orchestra of talented musicians, directed by Diane Trautman, that performed each note brilliantly. Not only did they perform each song perfectly, they really added an ambiance to the space. The lighting design was spot on- kudos to Tom McCarthy for his fantastic designs. The set, built to capture Maraczeck’s Parfumerie and the surrounding town, was beautiful. Scene painter Linda Sanborn brought to life buildings on the backdrops that simply jump off of the wall. My favorite part of seeing a show at Newtowne Player’s theatre is trying to guess how they will use their revolving stage, and they used it well in this show. Round and round the characters and settings went, and with each loop, the story deepened. The walls on the sides of the stage featured letters and hearts, which have their own unique story. I asked Director P. Wade Thompson about this at the end of the show, and he revealed that the letters and hearts represent the love stories of people across the world. He wanted to remind us that love transcends time and that we each have our own love story. How beautiful! The costumes, designed by Kristina Faison, were simple, period designs, and I love how the colors carried through for each character. The props and set dressings, designed by Aeryn Phillips, were perfectly suited: I loved the perfume carts. Set changes were seamless thanks to the Stage Manager Meg Pugh. Truly, each of these pieces came together in this production to make “She Loves Me” into the masterpiece it is. I am not a romantic, nor do I tend to enjoy sappy love stories. However, “She Loves Me” is not sappy, nor is it a boring love story. It is romantic, witty, and clever; a genuine masterpiece. I never thought I’d say this about a ‘love story’, but I love this show! If you are looking for a great way to celebrate the love of your life or just enjoy a story about falling in love, go see this show. You won’t be disappointed by the quality and the heart that Newtowne Players brings to the stage. Advisory: Some sexual innuendos, themes of suicide, and the use of language. Best suited for 13 and up with parental guidance. Running Time is approximately 2 hrs and 45 minutes, including a 15-minute intermission. “She Loves Me” will be playing at Newtowne Players in Lexington Park, MD from February 1-17, 2019. For more information, or to purchase tickets, please see here.